AirMed was established on June 16, 1978, as the eighth air medical transport program in the nation. We fly trauma, burns, medical, pediatric, neonate, high-risk OB, and cardiac assist device patients 24 hours a day with six helicopters and two airplanes placed throughout northern Utah and Wyoming. We use the most state-of-the-art equipment available, which includes digital capnography, invasive line management, and intra-aortic balloon pumps for transport. We utilize cutting-edge airway technology including video laryngoscopy, advanced portable ventilators, and a variety of adjuncts for securing difficult or complex airways. Although aircraft and uniforms have evolved over the years, the mission has stayed the same: "At AirMed we are committed to our mission of delivering the highest quality of care to our patients and will continue to strive for excellence in every aspect of our profession." AirMed services one of the largest geographical areas of any flight program in the nation, routinely transporting patients from Colorado, Wyoming, Nevada, Montana, and Idaho along with our home state of Utah. 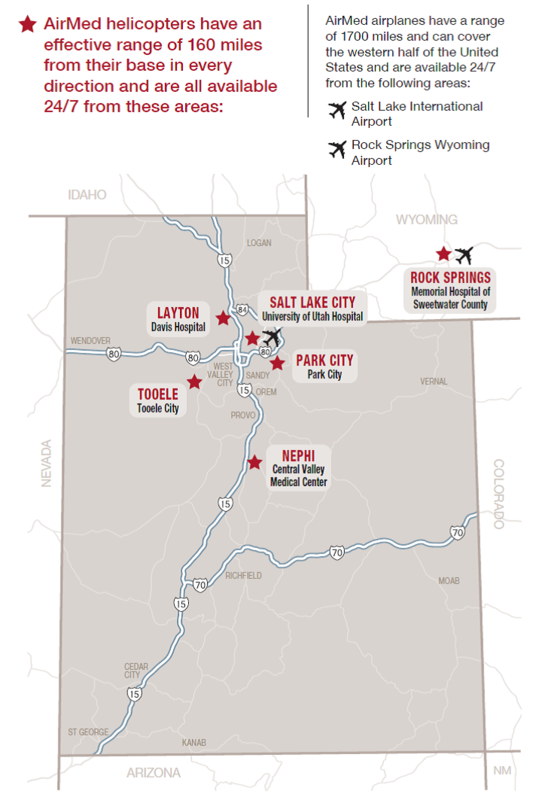 Our main base is the University of Utah Hospital with satellite bases located in Layton, Park City, Nephi, and Tooele Utah as well as two aircraft in Rock Springs, Wyoming. All AirMed bases are staffed 24/7 and our aircraft are equipped with the latest safety features, such as night vision goggles, GPS navigation, and terrain collision avoidance systems to ensure the highest level of safety for our patients and crew. Our team consists of a flight nurse and flight medic, but we also have the ability to add a flight respiratory therapist to our team if the information surrounding the flight suggests a need for more advanced respiratory care. AirMed flight nurses have a minimum of five years experience in a Level 1 Facility (three years in an ICU, two years in an ER). Flight medics have a minimum five years experience with a high-volume 911 agency. Flight respiratory therapists have a minimum of two years experience in an ICU and ER at University of Utah Health. All flight positions must have additional certifications that include, but are not limited to, ACLS, PALS, NRP, and BLS. 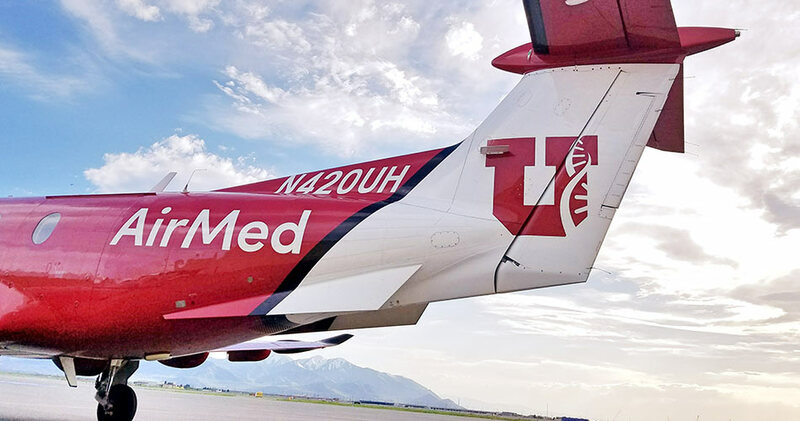 While AirMed will transport adult and pediatric patients to ANY facility, we are based out of the University of Utah’s Level 1 Trauma Center. As a result of our hospital affiliation AirMed team members receive ongoing training through ICU Rotations, OR Intubations, peer chart reviews, sim labs, and invasive procedure labs. Additionally we attend monthly staff meetings where we are able to review difficult cases with our medical control physicians to make sure we are providing the best care available to the patient’s we transport. The AirMed Perinatal Transport Team provides rapid, safe, and compassionate care while treating and transporting high risk pregnant patients and critically ill newborns. We are focused on improving outcomes to the patient, family, community, and mountain west region. Please call 877-247-6331 to activate our dedicated 24-hour perinatal team for air or ground transport. AirMed can transfer adult, pediatric, and neonatal patients to ANY facility. We fly trauma, burns, medical, pediatric, neonate, balloon pump, and high-risk OB patients 24 hours a day. We offer inter-facility transfers when the staff at any given health care facility has a patient they feel would benefit from receiving care at a hospital with additional resources.